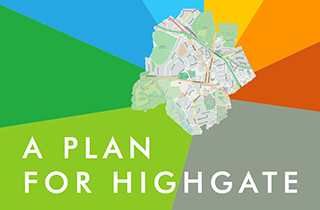 Planning – how we make Highgate a vibrant place, protecting its unique character and heritage while encouraging beneficial change – is at the heart of what the Forum is about. The Forum was established six years ago specifically to draw up a Neighbourhood Plan. After much consultation with residents it was overwhelmingly accepted in a referendum in 2017. That means that both the councils which administer our area, Camden and Haringey, must pay attention to the Neighbourhood Plan when they make plans or consider applications. The Plan, which you can read on this website sets out policies to guide planning decisions, big and small, and these can be quoted for or against specific proposals and must be taken into account. But the Forum is not the only body in Highgate involved in planning. For 50 years, since the rejected plan to route the A1 through the village, the Highgate Society has been fighting to protect the area from unwanted development and suggest better solutions. Then there are the Conservation Area Advisory Committees, set up by the Government when conservation areas were first established, who also express their views on proposed development. And of course, there are local councillors. So how does all this work? How do we make sure that people’s views and concerns are properly represented without getting in each other’s way? This is how we think it should work. The Forum, in conjunction with the Highgate Society and the Highgate and Holly Lodge CAACs who helped us write it, has set out our guiding policies in the Plan. And we are all taking it into account. The Forum will be active in making representations, usually in conjunction with other interested organisations, on major planning questions and applications which would mean significant change. A good example is the portfolio of plans which Highgate School are putting forward for expansion affecting different areas of Highgate. Scrutiny and advice on day to day planning applications is a matter for the Highgate Society and the CAACS. The HS has an expert planning committee involving architects, planners, engineers and heritage experts. It meets regularly and provides a drop-in advice service at 11 am every Saturday at 10a South Grove. It regularly comments in detail on controversial applications and keeps in touch with the appropriate officers of the Council. The CAACs meet regularly and consider applications. Making sure we stay in touch, members of the Forum Committee sit both on the CAACs and the HS Planning Committee so when necessary the Forum’s weight can be brought to bear on a specific issue. But we don’t want to duplicate effort and it may simply be by an endorsement of a representation by another body. And then there are trees, which an awful lot of people in Highgate care about it. Many of them are subject to planning too. Here a new Tree Group has been set up drawing on people from different organisations. Led by Louise Lewis of the Forum Committee it is looking at planning applications for reducing or felling trees, encouraging planting and also organising walks to appreciate the trees we have. More volunteers and participants needed.